The entire Residential Exposure Joint Venture (REJV) database is stored in the CARES NG® platform but it is available only to the REJV members This database collects, organizes and analyses label and use information for pesticide products used in and around the home; please refer to the section The REJV database for more information. The REJV data cannot be used in a residential assessment but the CARES NG® gives you the ability to query, summarize and analyse them through the REJV tool. This section describes how to get access to this tool and use it. 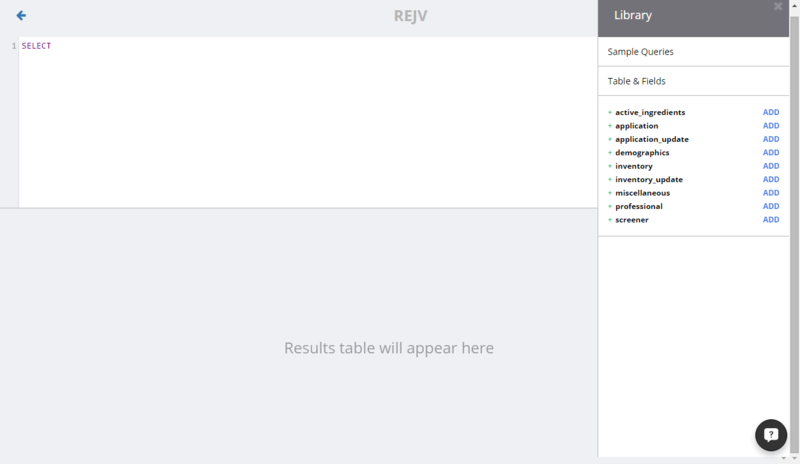 This tool works only on the tables that compose the REJV database and whose structure is described here under. Demographics – The Demographic data is the original sample frame of all individual that were asked to participate on the survey and received the screener questionnaire. The questionnaire captured the principal demographic data such as geography, household characteristics, and characteristics of the household members. Screener – The Screener data is the initial group of individuals that were asked to complete a screener questionnaire about pesticide use. The objective was to identify a pool of individuals representative of the US population that are pesticide users. Application – The Application data records where and when each product was applied. 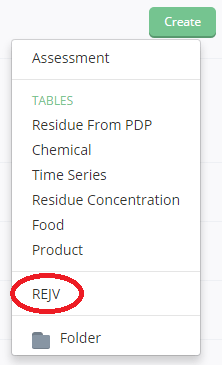 A ninth table, that does not belong to the original REJV database, is added to the list of the REJV tables installed in CARES NG® and it is called Active Ingredients. This table contains the list of the active ingredients, both their codes and their names, recorded in the REJV database. It is possible to use this table in the REJV tool to perform analyses on specific active ingredients. 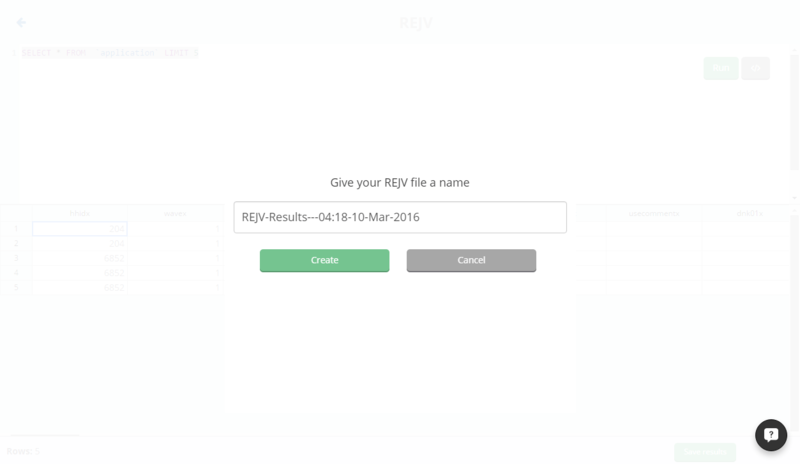 All these tables are saved and made available in a specific folder, called REJV, which is listed under the CARES Data folder in the CARES NG® File Management System. In the CARES NG® File Management System, browse to the My Data folder, Group Data folder or any subfolder. 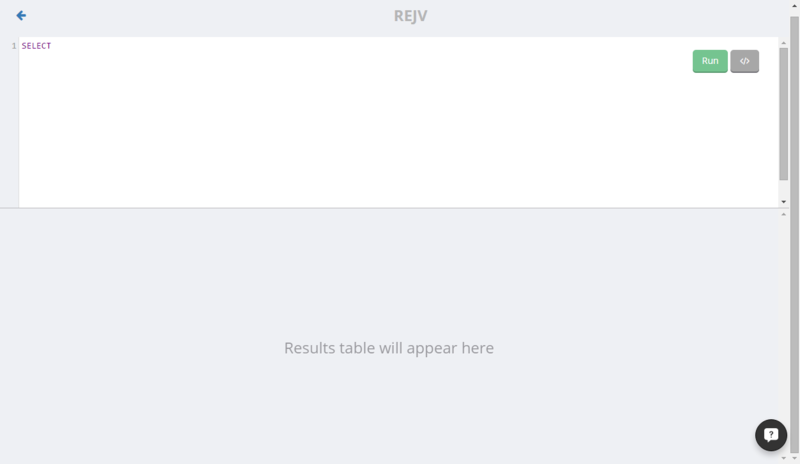 Click on and select REJV in the dropdown list. 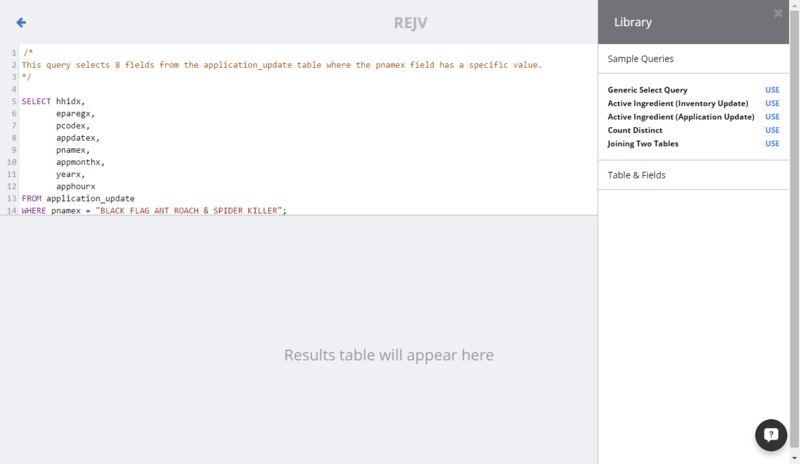 The sidebar was design to help you writing the SQL queries to be run in the REJV tool; the sections here under describe how insert the information provided by the sidebar into the SQL queries. The scope of this tutorial is not to teach the MySQL language, but to explain how to write and run SQL queries in the REJV tool and save the results of these queries in the CARES NG® platform. It is possible to find friendly and comprehensive MySQL tutorials online, such as W3 schools or Tutorials Point. 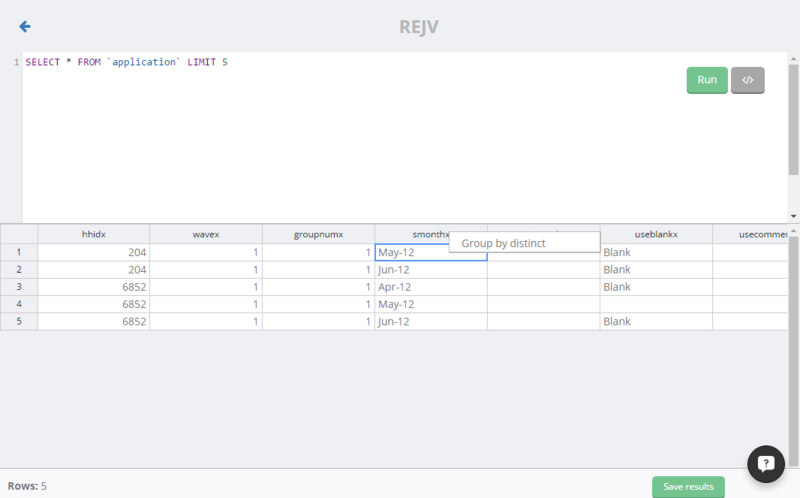 The REJV tables are not editable and cannot be modified; hence the REJV tool allows you to select a subset of the data contained in the database and carry out some data manipulation such as grouping the data and calculating a number of summary statistics. All the MySQL queries to perform these type of actions begin with the command SELECT; this is the reason why the MySQL editor contains by default the SELECT command. the button which allows you to save the result of the query into a new table. Click on ; it opens a pop-up windows that allow you to assign a name to the new table which contains the result of the MySQL query. CARES NG® provides a default name to the table, which is formed by the string REJV-Results— followed by the time and the date when the table is created. The new table is automatically opened in the CARES NG® Data Editor; the new table is not editable, but you can perform further analyses on the data by using the filtering and sorting tools of the Data Editor. 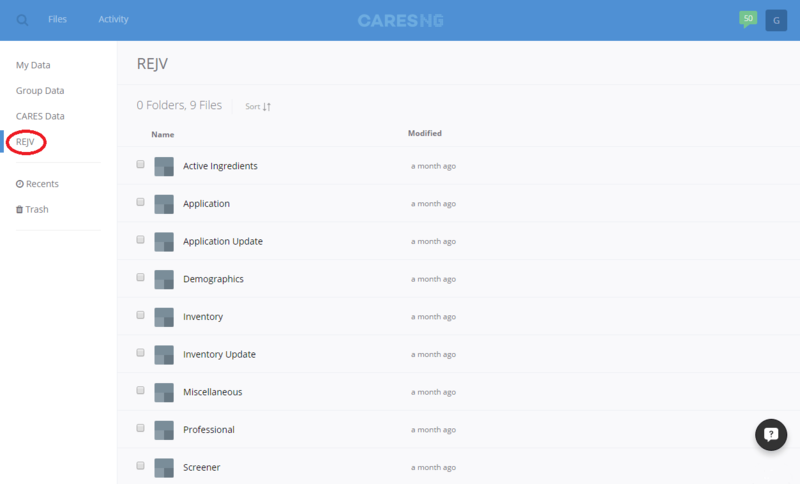 Click on to close the table and go back into the CARES NG® File Management System. The REJV tool allows you to query in a straightforward way the frequency of all the distinct values present in each column of the table in the result area. Right-click on the header of column of interest; a drop-down list appears under the header with the option Group by distinct. Click on to open the sidebar and then click on Sample Queries. Active Ingredient (Inventory Update); it selects all fields (*) from the Inventory Update table where any one of six columns has a specific value. 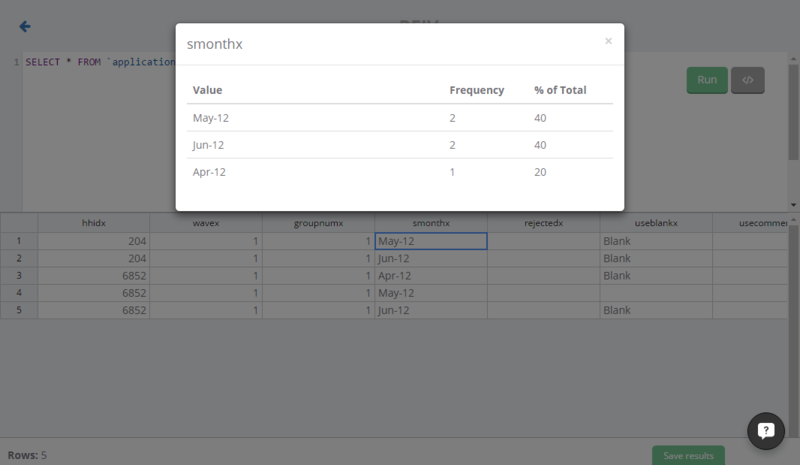 Active Ingredient (Application Update); it selects all fields (*) from the Application Update table where any one of six columns has a specific value. Delete the default SELECT from the MySQL editor and click on USE beside the name of the query you want to use; the MySQL code of the query is automatically inserted and displayed in the editor of the REJV tool. For example, click on USE beside the query Generic Select Query; the editor contains the code of this query, as shown in the image below. Close the sidebar by clicking on the X in the top right corner; then click on to run the query and inspect the result. 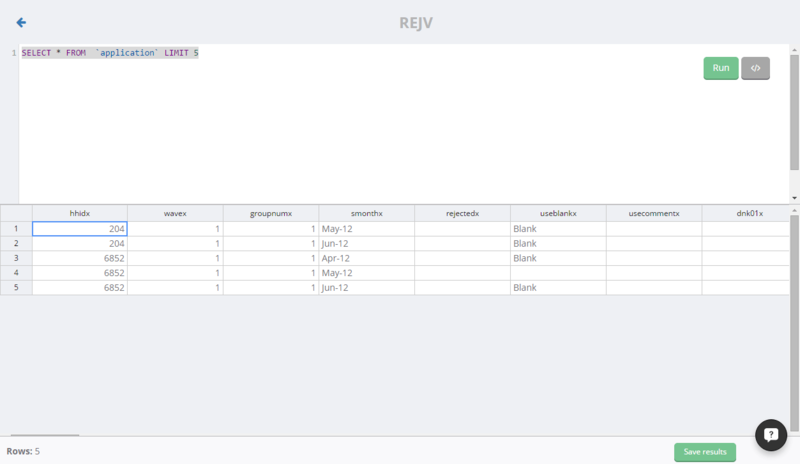 The query is editable and you can modify it in order to select and analyse other subsets of the REJV data. It is possible to change the list of the fields and the tables used in the query by selecting them from the list displayed in the Table & Fields section of the sidebar, as explained in the following section. 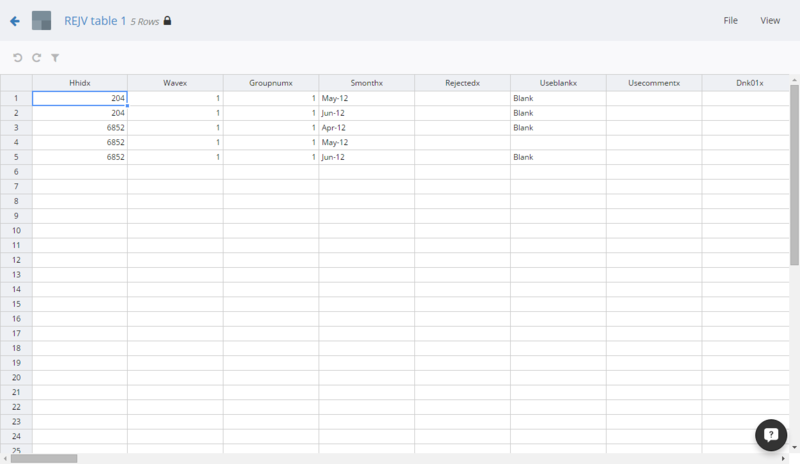 The Table & Fields was designed to provide a quick way to insert tables and fields into the MySQL queries. Open the sidebar and click on Table & Fields; you are presented with the list of the nine tales composing the REJV database.